The coastline of Sydney is typified by a landscape of stunning cliff-fringed beaches and rock platforms that rise dramatically from the surf to a high escarpment. The escarpment edge connects the saddles of bays with rocky headlands, forming a series of natural amphitheatres that vault along the coastline. This sandstone escarpment edge, exposed to the salt and wind was once the traditional walking edge for Indigenous people; providing both prospect and a structure for navigating the landscape. Outcrop House is sited in such a place, a sandstone escarpment edge facing due south over bush, beach and ocean. An ephemeral rivulet connects the site both physically and emotionally to the beach below. Prevailing winds from the south accelerate across the beach, searing up over the escarpment edge, giving this place a rugged quality. A primary challenge was to resolve the southern aspect with access to northern winter sun. As with many of Sydney’s populated ocean edges this place is a point along the final line between suburbia and wilderness, irreversibly connected between urbanity and landscape. Capturing this rawness, a single large-scale aperture opens from the house over Whale Beach to the south. The opening, and hence the prospect of the site, is theatrically staged through a series of frames, accessed from the platforms and volumes of the house. The roof canopy and exterior wall structures form one primary room into which secondary interior elements have been placed. The roof slopes up to the north allowing solar access in winter and consists of a layering of curved timber elements below a triple skin polycarbonate skin, which allows light to filter and refract into the interior, filling the house with a magical shifting light. Responding to its south-facing aspect, a winter courtyard defines the northern perimeter of the house. 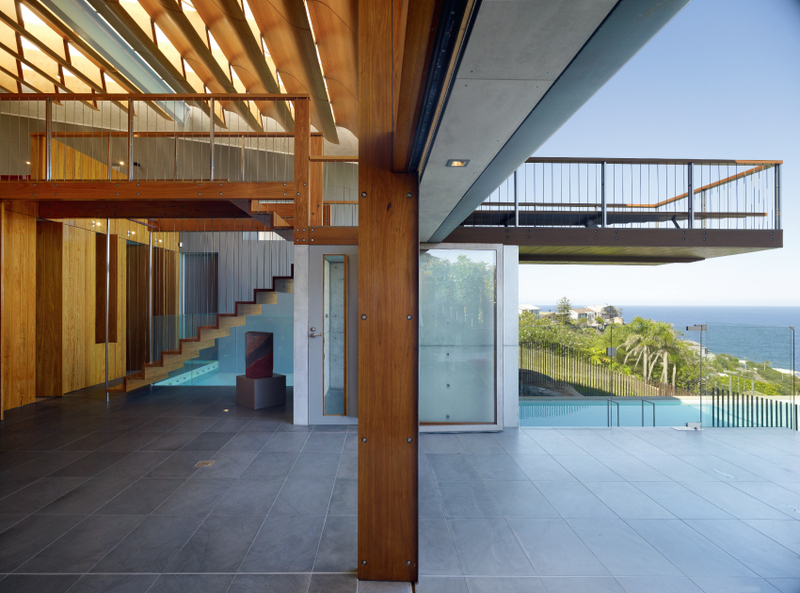 For additional thermal control, the house has been recessed into the escarpment, locking it into the land amongst this soft sedimentary geology. In keeping with the simplicity of the place – heath, rock, sand and wind – the building is restrained and subtle, an enclave that offers comfort and a constant sense of placement.